BASENGEZI, Marcellin (a.k.a. BASENGEZI, Marcellin Mukolo; a.k.a. MAKOLO, Marcelin Basengezi; a.k.a. MUKOLO, Basengezi Marcellin), Appartement 29 Cite Du Fleuve, Cite Du Fleuve, Kingabwa Limete, Kinshasa, Congo, Democratic Republic of the; DOB 30 Nov 1985; POB Kaziba, Congo, Democratic Republic of the; Gender Male; Passport OP0155187 (Congo, Democratic Republic of the) issued 24 Jan 2016 expires 19 Jan 2021 (individual) [DRCONGO]. KATINTIMA, Norbert Basengezi (a.k.a. KATINTIMA, Norbert Bashengezi), 15 Joli Parc, Ma Campagne, Kinshasa 00243, Congo, Democratic Republic of the; DOB 10 Jan 1958; POB Kashiramo-Kaziba, South Kivu, Congo, Democratic Republic of the; alt. POB Rwanda; nationality Congo, Democratic Republic of the; alt. nationality Rwanda; Gender Male; Vice-President of the Independent National Electoral Commission (individual) [DRCONGO]. NANGAA, Corneille Yobeluo (a.k.a. YOBELUO, Corneille Nangaa), 36 Q Solongo Blvd, Biangala, Lemba, Kinshasa, Congo, Democratic Republic of the; DOB 09 Jul 1970; POB Bagboya, Congo, Democratic Republic of the; Gender Male; Passport DP0003850 (Congo, Democratic Republic of the) issued 20 Nov 2017 expires 19 Nov 2022; alt. Passport DP0000149 (Congo, Democratic Republic of the) issued 12 Jan 2016 expires 11 Jan 2021 (individual) [DRCONGO]. DALIAN HAIBO INTERNATIONAL FREIGHT CO. LTD., 1103 A, Fortune Plaza No. 20, Harbour Street, Zhongshan District, Dalian, China; Secondary sanctions risk: North Korea Sanctions Regulations, sections 510.201 and 510.210 [DPRK3]. LIAONING DANXING INTERNATIONAL FORWARDING CO. LTD. (Chinese Simplified: 辽宁丹兴国际货运有限公司), Room D1302, Langham Place, East Harbour, No. 11 Zhubao Street, Ganglong Road, Dalian, China; Secondary sanctions risk: North Korea Sanctions Regulations, sections 510.201 and 510.210; Registration Number 91210200242663544B [DPRK4]. ISLAMIC STATE OF IRAQ AND THE LEVANT (a.k.a. AD-DAWLA AL-ISLAMIYYA FI AL-‘IRAQ WA-SH-SHAM; a.k.a. AL-FURQAN ESTABLISHMENT FOR MEDIA PRODUCTION; a.k.a. AL-QAIDA GROUP OF JIHAD IN IRAQ; a.k.a. AL-QAIDA GROUP OF JIHAD IN THE LAND OF THE TWO RIVERS; a.k.a. AL-QAIDA IN IRAQ; a.k.a. AL-QAIDA IN MESOPOTAMIA; a.k.a. AL-QAIDA IN THE LAND OF THE TWO RIVERS; a.k.a. AL-QAIDA OF JIHAD IN IRAQ; a.k.a. AL-QAIDA OF JIHAD ORGANIZATION IN THE LAND OF THE TWO RIVERS; a.k.a. AL-QAIDA OF THE JIHAD IN THE LAND OF THE TWO RIVERS; a.k.a. AL-TAWHID; a.k.a. AL-ZARQAWI NETWORK; a.k.a. DAESH; a.k.a. DAWLA AL ISLAMIYA; a.k.a. ISIL; a.k.a. ISIS; a.k.a. ISLAMIC STATE; a.k.a. ISLAMIC STATE OF IRAQ; a.k.a. ISLAMIC STATE OF IRAQ AND AL-SHAM; a.k.a. ISLAMIC STATE OF IRAQ AND SYRIA; a.k.a. JAM’AT AL TAWHID WA’AL-JIHAD; a.k.a. TANZEEM QA’IDAT AL JIHAD/BILAD AL RAAFIDAINI; a.k.a. TANZIM QA’IDAT AL-JIHAD FI BILAD AL-RAFIDAYN; a.k.a. THE MONOTHEISM AND JIHAD GROUP; a.k.a. THE ORGANIZATION BASE OF JIHAD/COUNTRY OF THE TWO RIVERS; a.k.a. THE ORGANIZATION BASE OF JIHAD/MESOPOTAMIA; a.k.a. THE ORGANIZATION OF AL-JIHAD’S BASE IN IRAQ; a.k.a. THE ORGANIZATION OF AL-JIHAD’S BASE IN THE LAND OF THE TWO RIVERS; a.k.a. THE ORGANIZATION OF AL-JIHAD’S BASE OF OPERATIONS IN IRAQ; a.k.a. THE ORGANIZATION OF AL-JIHAD’S BASE OF OPERATIONS IN THE LAND OF THE TWO RIVERS; a.k.a. THE ORGANIZATION OF JIHAD’S BASE IN THE COUNTRY OF THE TWO RIVERS) [FTO] [SDGT]. -to- ISLAMIC STATE OF IRAQ AND THE LEVANT (a.k.a. AD-DAWLA AL-ISLAMIYYA FI AL-‘IRAQ WA-SH-SHAM; a.k.a. AL HAYAT MEDIA CENTER; a.k.a. AL-FURQAN ESTABLISHMENT FOR MEDIA PRODUCTION; a.k.a. AL-HAYAT MEDIA CENTER; a.k.a. AL-QAIDA GROUP OF JIHAD IN IRAQ; a.k.a. AL-QAIDA GROUP OF JIHAD IN THE LAND OF THE TWO RIVERS; a.k.a. AL-QAIDA IN IRAQ; a.k.a. AL-QAIDA IN MESOPOTAMIA; a.k.a. AL-QAIDA IN THE LAND OF THE TWO RIVERS; a.k.a. AL-QAIDA OF JIHAD IN IRAQ; a.k.a. AL-QAIDA OF JIHAD ORGANIZATION IN THE LAND OF THE TWO RIVERS; a.k.a. AL-QAIDA OF THE JIHAD IN THE LAND OF THE TWO RIVERS; a.k.a. AL-TAWHID; a.k.a. AL-ZARQAWI NETWORK; a.k.a. AMAQ NEWS AGENCY; a.k.a. DAESH; a.k.a. DAWLA AL ISLAMIYA; a.k.a. ISIL; a.k.a. ISIS; a.k.a. ISLAMIC STATE; a.k.a. ISLAMIC STATE OF IRAQ; a.k.a. ISLAMIC STATE OF IRAQ AND AL-SHAM; a.k.a. ISLAMIC STATE OF IRAQ AND SYRIA; a.k.a. JAM’AT AL TAWHID WA’AL-JIHAD; a.k.a. TANZEEM QA’IDAT AL JIHAD/BILAD AL RAAFIDAINI; a.k.a. TANZIM QA’IDAT AL-JIHAD FI BILAD AL-RAFIDAYN; a.k.a. THE MONOTHEISM AND JIHAD GROUP; a.k.a. THE ORGANIZATION BASE OF JIHAD/COUNTRY OF THE TWO RIVERS; a.k.a. THE ORGANIZATION BASE OF JIHAD/MESOPOTAMIA; a.k.a. THE ORGANIZATION OF AL-JIHAD’S BASE IN IRAQ; a.k.a. THE ORGANIZATION OF AL-JIHAD’S BASE IN THE LAND OF THE TWO RIVERS; a.k.a. THE ORGANIZATION OF AL-JIHAD’S BASE OF OPERATIONS IN IRAQ; a.k.a. THE ORGANIZATION OF AL-JIHAD’S BASE OF OPERATIONS IN THE LAND OF THE TWO RIVERS; a.k.a. THE ORGANIZATION OF JIHAD’S BASE IN THE COUNTRY OF THE TWO RIVERS; a.k.a. “AL HAYAT”) [FTO] [SDGT]. Additionally, the Coast Guard, Treasury and State Departments issued an updated, 19-page guidance document on “North Korea’s Illicit Shipping Practices”. Under Nangaa’s leadership, CENI officials inflated by as much as $100 million the costs for the electronic voting machine contract with the intent to use surplus funds for personal enrichment, bribes, and campaign costs to fund the election campaign of Kabila’s candidate. Nangaa, with other CENI officials, awarded an election-related contract and doubled the award amount on the understanding that the winning company would award the extra funds to a DRC company controlled by CENI leadership. Nangaa approved the withdrawal of CENI operation funds for non-authorized budget items for personal use by DRC government employees. Nangaa ordered CENI employees to fabricate expense receipts to cover spending gaps resulting from CENI funds being used for personal gain. Nangaa delivered bribes to Constitutional Court justices to uphold a decision by the CENI to delay DRC’s 2016 elections. WASHINGTON – The U.S. Department of the Treasury’s Office of Foreign Assets Control (OFAC) today announced the designation of two shipping companies that have helped North Korea evade sanctions. Today’s action highlights the deceptive methods that the North Korean regime uses to circumvent international and U.S. sanctions, as well as the U.S. Government’s commitment to implement existing UN Security Council (UNSC) resolutions. Both companies are based in China. In a related action, OFAC, along with the U.S. Department of State and the U.S. Coast Guard, is updating the North Korea shipping advisory and adding dozens of vessels that are believed to have engaged in ship-to-ship (STS) transfers with North Korean tankers or exported North Korean coal. OFAC designated Dalian Haibo International Freight Co. Ltd. (Dalian Haibo) pursuant to Executive Order (E.O.) 13722 for providing goods and services to or in support of the U.S.-designated Paeksol Trading Corporation (Paeksol). Paeksol is also subordinate to the UN- and U.S.-designated Reconnaissance General Bureau (RGB). OFAC previously designated Paeksol for having sold, supplied, transferred, or purchased metal or coal from North Korea, where the revenue may have benefited the Government of North Korea or the Workers’ Party of Korea. In early 2018, Dalian Haibo shipped cargo from Dalian, China to Paeksol in Nampo, North Korea, aboard DPRK-flagged vessels. 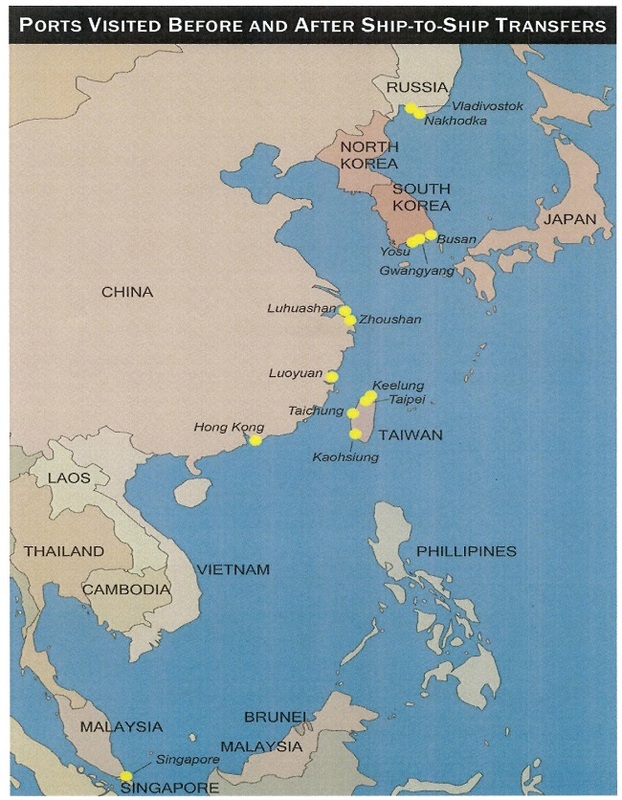 OFAC also designated Liaoning Danxing International Forwarding Co. Ltd. (Liaoning Danxing) pursuant to E.O. 13810 for operating in the transportation industry in North Korea. Liaoning Danxing routinely used deceptive practices that enabled EU-based North Korean procurement officials to operate and purchase goods for the DPRK regime. This shipping advisory updates the February 23, 2018 advisory with new information about North Korea’s deceptive shipping practices, additional guidance on how to mitigate the risk of involvement in these practices, a new graphic depicting certain ports of call, and three new annexes, (1) guidance for member states and industry to avoid illicit North Korean maritime trade, (2) dozens of vessels that are believed to have engaged in ship-to-ship transfers with North Korean Tankers, and (3) dozens of vessels that may have exported North Korean coal since August 5, 2017. As further detailed in the advisory, North Korea employs deceptive shipping practices such as disabling or manipulating automated identification systems, physically altering vessels, conducting (STS transfers, and falsifying cargo documentation. 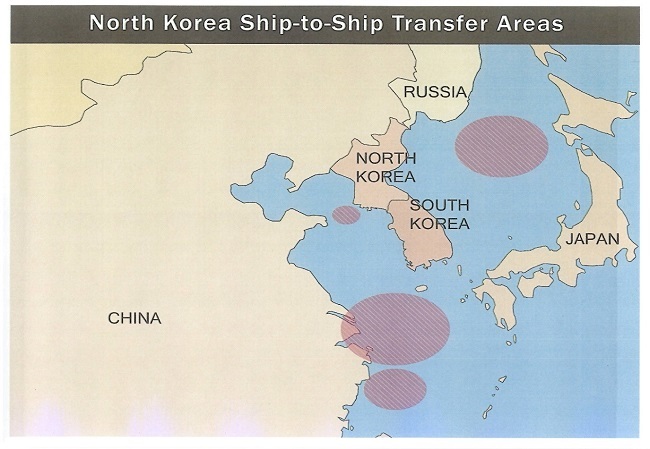 Since initial publication in February 2018, North Korea has altered the geographic location of STS transfers and has resumed exports of coal in the Gulf of Tonkin. As a result of today’s action, any property or interests in property of the designated persons in the possession or control of U.S. persons or within or transiting the United States is blocked, and U.S. persons generally are prohibited from dealing with the designated persons. The Department of State has amended the terrorist designations of the Islamic State of Iraq and Syria (ISIS) to include Amaq News Agency, Al Hayat Media Center, and other aliases. These aliases have been added to ISIS’s designation as a Foreign Terrorist Organization (FTO) under Section 219 of the Immigration and Nationality Act, and as a Specially Designated Global Terrorist (SDGT) under Executive Order 13224. Additionally the Department of State has reviewed and maintained the FTO designation of ISIS.